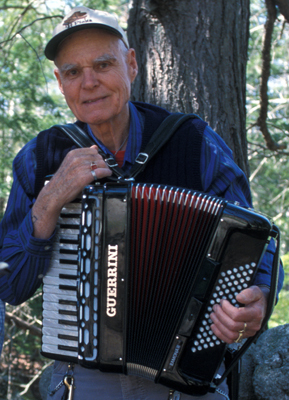 Longtime resident of Peterborough, Bob or “Mac” as he was known, was a much beloved member of the contra dance community and was a tireless performer who crisscrossed the state and the country to play for dance halls in small town halls, major festival venues and for family gatherings for over 60 years. After returning from service, Bob began attending square dances led by the legendary dance caller, Ralph Page. He was later was asked to join the Ralph Page Orchestra, and went on to play with numerous groups and musicians on both piano and accordion, and played at the Nelson Monday night dances for decades. Bob loved to provide a steady driving rhythm for dancers with his unmistakable “boom-chuck” style of piano playing. Most recently Bob was a member of Old New England, a trio that included fiddler Jane Orzechowski and flutist Deanna Stiles. In 1999, Old New England was invited to represent New Hampshire at the 1999 Smithsonian Folklife Festival were they shared their music with thousands of visitors from across the country. Their recordings can be found on the NH Council on the Arts Traditional Music collection. Bob was also a prolific composer of tunes, with over 1300 to his credit. He wrote his first tune Scotty O’Neil in 1973 in honor of a former student. Many of his tunes were named after friends and events in his life, and have since become standards within the tradition. Amelia’s Waltz, a favorite around the country, was written for Deanna’s daughter. Bob was a generous teacher and he mentored many musicians throughout his lifetime. He served as a master artist to six young musicians through the New Hampshire State Council on the Art’s Traditional Arts Apprenticeship Program. In 1997, Bob was honored with a Governor’s Arts Award in Folk Heritage for his dedication to preserving contra dance music in New Hampshire. In 2002, he was awarded a National Heritage Fellowship from the National Endowment for the Arts, the highest national honor for folk and traditional arts. In 2009 he was awarded a Lifetime Contribution Award from the Country Dance & Song Society. Bob was known for his wit and humor. He once described playing music for contra dances like, “Getting paid to eat ice cream”, which later became the title of a documentary produced about McQuillen by David Millstone. Bob’s legacy to the traditional music of New Hampshire that will never be forgotten. Listen to a recording of Bob playing on the NEA’s website. Listen to a 2004 interview with Bob McQuillen by Lynn Martin Graton.